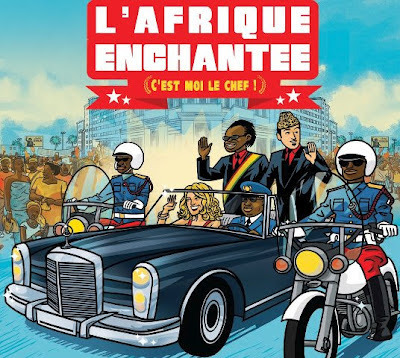 GLOBAL A GO-GO: L'Afrique Enchantee: C'est Moi Le Chef! TITLE: L’Afrique Enchantee: C’est Moi Le Chef! “L’Afrique Enchantee” is a weekly African music radio program on France Inter (French public radio). Hosts Soro Solo and Vladimir Cagnolari have curated this superb compilation with the theme “African musical meditations on the exercise of power.” They cover plenty of ground (50 years of history and 12 countries) in choosing 14 songs plus two news clips that neatly arc from the optimism of independence to today’s post-modern cynicism. The collection includes two universally-regarded African “golden age” (late 60s to early 80s) musical masterpieces (7 and 13) and two obscure recordings (4 and 9) that are on a similarly lofty plane. And they make room for contemporary material as well, with two hard-hitting Afro-reggae numbers (10 and 11) and a pair of hip-hop flavored tracks from Burkina Faso (14 and 15). An understanding of French helps but (as I can testify) isn’t essential for the enjoyment of this outstanding project. For concept, execution and general musical excellence, this is certainly one of the finest compilations of the year.